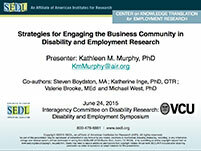 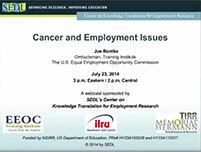 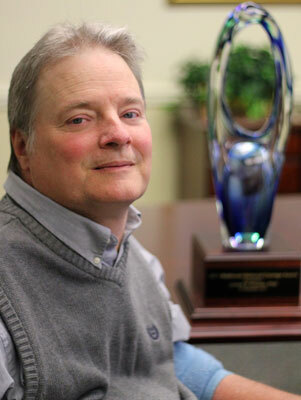 The KTER Center presents several brief “webisodes” to share up-to-date information about our research efforts with a goal of improving employment outcomes for people with disabilities. 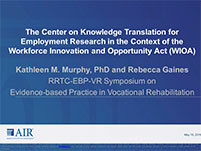 Rehabilitation Research and Training Center on Evidence-based Practice in Vocational Rehabilitation Symposium (Madison, WI), The Center on Knowledge Translation for Employment Research (KTER Center) in the context of the Workforce Innovation and Opportunity Act (WIOA). 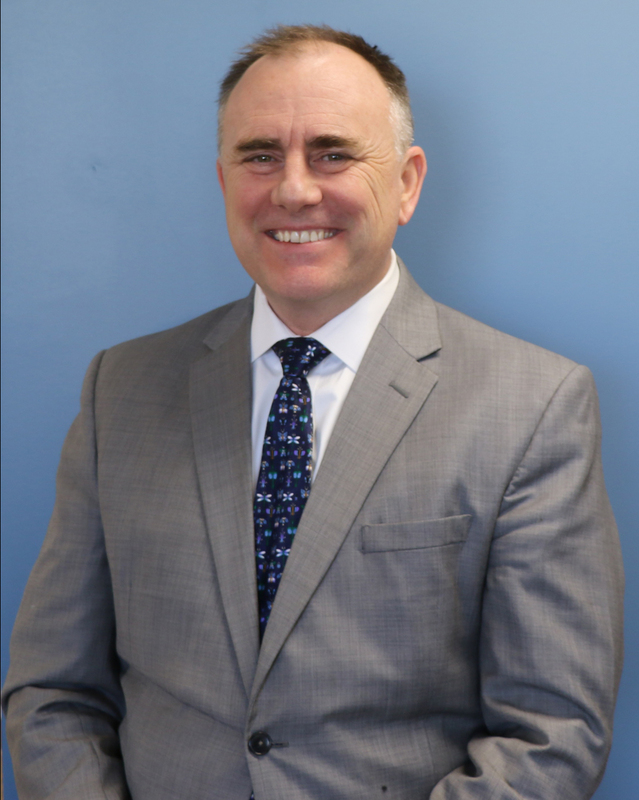 May 19, 2016. 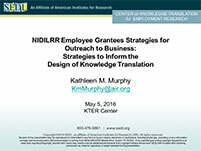 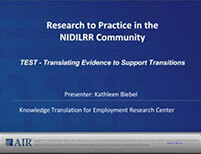 NARRTC Conference (Alexandria, VA) - Symposium: NIDILRR Employee Grantees' Strategies for Outreach to Business: Strategies to Inform the Design of Knowledge Translation, May 6, 2016. 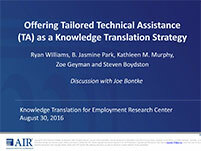 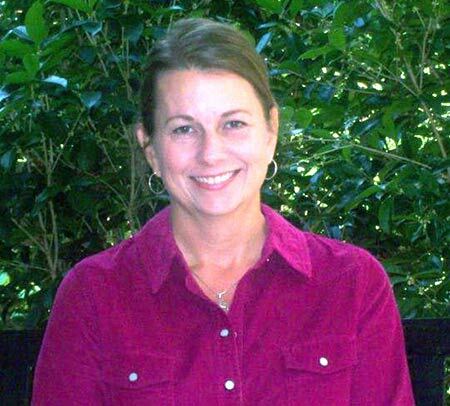 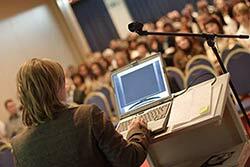 The web-based conference, "State of the Science: Knowledge Translation for Employment Research," took place September 16-17, 2014 to address employment research for people with disabilities and the best ways to get research results into use. 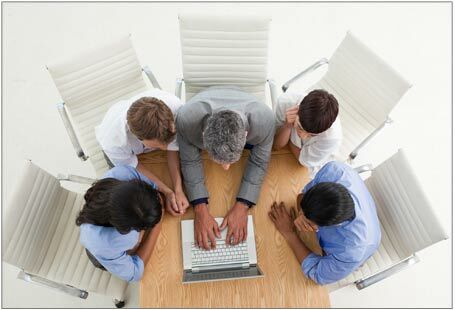 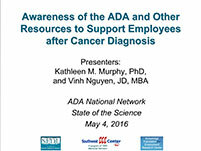 This one hour training will help managers, supervisors, and human resource professionals to learn more about cancer-related workplace issues, recent changes to the ADA, and how best to help employees with cancer and their colleagues maintain a productive, supportive workplace environment.